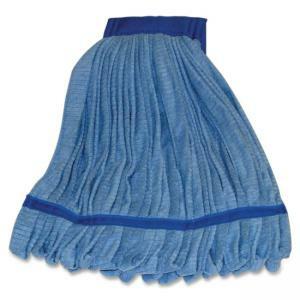 Microfiber wet mophead refill is designed for use with the versatile, Genuine Joe Complete Wet Mop with 60" gripper handle (sold separately). Pick this mophead refill for small jobs. Mophead is very absorbent and delivers a minimum five times the launderability of traditional yarn mops. With microfiber, less chemical is required. The textured finish loosens and holds dirt until washed. The mophead is priced competitively with traditional blended, looped yarn mopheads yet outperforms traditional mops in both cleaning and durability. Canvas headband is durable in laundering.